The smartest conveyancing software that will manage your matters and automate tasks. Improve collaboration within your team and eliminate duplication by having one matter file which is fully searchable. Every conveyancing matter is allocated an electronic file that hosts all data, documents, emails and property searches important to your matter. LEAP Conveyancer includes the full spectrum of input fields to capture the data you need. Recurring matter templates support subdivisions and off-the-plan work. The settlement statement sheet automatically calculates amounts entered in the matter to complete forms that you can send directly to your client. Even if the settlement date changes, the figures can be automatically recalculated in an instant. With many of the state's governments implementing a timeline for complete digital transactions, firms are quickly moving to electronic conveyancing. 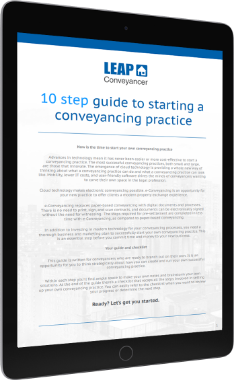 Complete electronic conveyancing is available from within LEAP Conveyancer, including: conveyancing matter types, VOI, certificates and searches, contract, e-Signing, exchange and electronic settlement. Your InfoTrack search results are saved back to the matter and searching costs are automatically captured as a cost recovery, ready for your next invoice. You will improve your order search time by up to 40% while ensuring you don't have to write off disbursements. LEAP Conveyancer fully integrates with Microsoft Outlook to provide an intuitive workflow that saves time. You can save all relevant emails and attachments directly to the matter. LEAP Conveyancer includes a comprehensive trust and office accounting package to take the stress out of dealing with both trust accounts and controlled monies accounts. LEAP Conveyancer also supports fixed-fee billing. Matter information is auto-populated onto LEAP Forms and By Lawyers legally drafted precedents. This automation saves you time and significantly reduces the chance of errors. You can also upload your firm's own precedents into LEAP. The LEAP Mobile App supports working on the go and synchronises with your desktop version. Your client information is accessible, and you can share documents, send emails, and scan notes from your camera. The LEAP Mobile App is available for Android and iOS devices.